Our 2nd lecture capture conference last month, attended by over 70 delegates, received very positive feedback and generated some fantastic debates about the value of lecture capture. There was general agreement that it would be useful to run another event with a similar focus (on pedagogic research around lecture capture) later this year, and we’ll certainly look at doing this. All the main presentations were captured and can be accessed below. Details of the sessions can be found here. 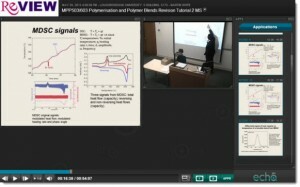 Students using weblectures: do they perform better? One of the outcomes from recent discussions at University Learning and Teaching Committee about institutional lecture capture policy is that the Teaching Centre have now set up a lecture capture research project, led by Janette Matthews from the Maths Education Centre. This will involve running focus groups and surveys with both staff and students, with a particular focus on the attitudes and experiences of academic staff. In this context, last week’s ReCALL webinar on whether students perform better with access to ‘weblectures’ was particularly interesting. You can play back a recording of the webinar below here. We know that students want to see more use of the ReVIEW lecture capture system campus-wide – this message is coming back loud and clear from the LSU Executive and surveys such as the Facilities Management teaching and learning space survey back in May. The demand is being reflected in increasing take-up by academic colleagues. So far this semester we’ve been capturing roughly double the quantity of lectures compared with the same period last year, and in fact IT Services colleagues have had to ‘beef up’ the processing power available to the back-end system in order to speed up the queue of captured lectures waiting to be processed. A lecture capture working group is now being set up, comprising senior academic staff from across the campus, and this will be making recommendations on the next steps in the development of an institutional strategy in this area. LectureTools is a web-based alternative to dedicated electronic voting systems (aka clickers) such as Turning Point which we use here at Loughborough. Developed by Dr Perry Samson, a Professor of Atmospheric Science at the University of Michigan, the service was acquired this year by Echo 360, the company behind our ReVIEW lecture capture service. In many respects it is similar to Socrative and other online voting systems we’ve blogged about previously (see https://blog.lboro.ac.uk/elearning/?p=2462). For us, the particular attraction is that it’s gradually being integrated into the Echo 360 / ReVIEW lecture capture system which, over the course of time, will evolve into what the company call an ‘active learning platform’. In addition, there is already a level of integration with Moodle and therefore Learn (as we call Moodle here at Loughborough). 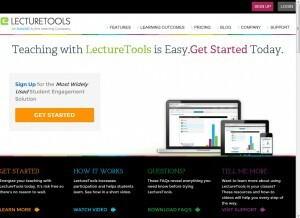 What this means in practice is that, as a module tutor, you can add ‘LectureTools’ as an activity on your module page creating a ‘bridge’ to your course on LectureTools. During a lecture, students can access your presentation via this link, from whatever mobile device they happen to have with them – smartphone, tablet, phablet, netbook, laptop, Chromebook… you get the idea. Where you have a question slide, instead of responding via a clicker, they do it from the mobile device. There are two benefits to this: (1) you don’t have to get colleagues in Teaching Support to bring out 200 clickers; and (2) because the system is not just limited to keypresses, additional question types (such as drag ‘n’ drop) are possible. – Feedback from students to the programme manager was highly complimentary for the modules using lecture capture. 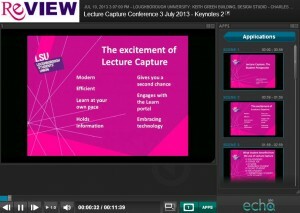 – Part-time distance learning students, discussing their module choices for 2013-14, have been specifically asking for modules with lecture capture. 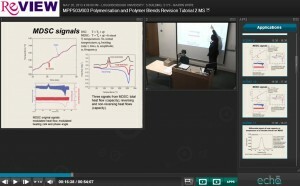 – There has been no negative feedback or criticism of the video lecture content by any student. – Full-time students also found the recordings useful with an especially high level of interest around exam revision time. – The overseas students where English is not their first language found video captures especially useful to clarify some lecture topics. – In response to a call to Semester 1 lecturers asking them if they want to have their lectures recorded again this year the response has been very positive and those lecturers who did not have their lectures captured last year have chosen to do so this year. 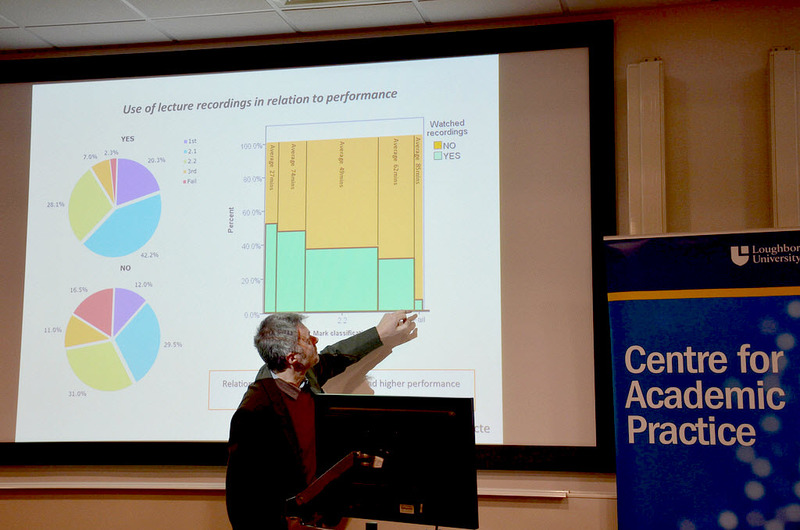 – A number of lecturers found that using lecture capture significantly reduced the amount of work they had to put into distance learning materials for part time students, in one case scrapping all old printed materials (booklets) and replacing with Video lectures and online content only. 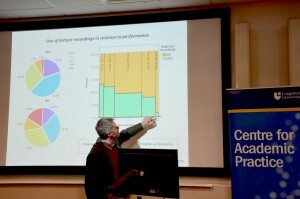 – Lecturers were very pleased with the results and didn’t find the process hard to engage with. Using the visualisers in lectures was especially popular. As the University considers a step-change in its strategy around lecture capture, the Jisc Legal service have very helpfully published a new checklist aimed at tutors covering the questions you consider around copyright and othe IPR issues before embarking on recording your lectures. We’ll adapt this and build this into the support resources we give to academic colleagues. The second keynote presentation at our recent lecture capture conference was given by Lazar Zindovic, the outgoing VP Education of the Loughborough Students’ Union. Laz, who has been an enthusiastic and vocal advocate of lecture capture during his year in office, talked about the student perspective on this particular learning technology. Click to view the recorded presentation (audio and slides only).